On November 15 2014 Tim Berners-Lee delivered the opening keynote at the Every Second Counts Forum in London. The forum, with the theme ‘Shaping the future, when the future is already here‘, invited pioneering individuals to talk about the formative moments that have shaped their careers with an emphasis on timeliness. Tim goes through the early days of World Wide Web development, and finishes with passionate arguments for net neutrality and a practical micropayment system for web content. Video is below. 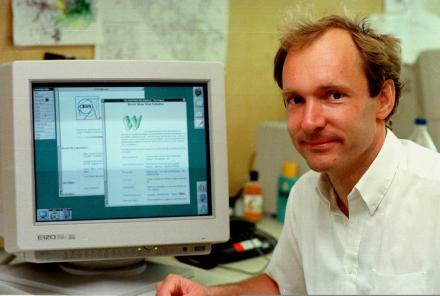 Today, Wednesday October 29 2014 the World Wide Web Consortium (W3C) will, in celebration of its 20th Anniversary, present a symposium – The Future of the Web in Santa Clara,CA. The 3-hour symposium will discuss how the Web community can: Build a more beautiful Web to enable our creative expression; Extend the Web to the many devices people use to improve their lives; Support trusted communications, secure and private; and Empower all people to use and contribute to the Web, including support for diverse languages and accessibility. Speakers include Tim Berners Lee, Vint Cerf, Fadi Chehadé, and Sue Gardner. The event will be webcast live at 6pm NYC time. for Internet Governance Cooperation & Development. Today Thursday 28 August 2014 they are holding the Initial Scoping Meeting in Geneva with leaders from government, business, civil society and academia. Participants include Kathryn Brown of the Internet Society, Fadi Chehadé of ICANN, Tim Berners Lee of WWWF, Hamadoun Touré of the ITU, and Lawrence Strickling of the NTIA. It is being webcast live the WEF Livestream Channel. Sir Tim Berners Lee was this year’s keynote speaker at Telekom Austria Group’s future.talk 2011 which had the theme World Wild Web – Who Rules the Internet Society?. Other speakers included; journalist Antonia Rados, who talked about the Arab spring; O.I.I. professor Viktor Mayer-Schönberger who talked about his current efforts to use Wikipedia to predict revolutions; and Anke Domscheit-Berg who talked about Open Government, a topic on which Berners-Lee also touched. Tim Berners-Lee’s segment begins at 15:30. Panel starts at 41:00. The Internet Society (ISOC) will present an INET Regional Conference on June 14 2011 at the Sentry Center in NYC. The theme is “It’s your call. What kind Of Internet do you want? “. The distinguished line up of speakers will include ‘Father of the Internet’ Vint Cerf, World Wide Web inventor Sir Tim Berners Lee, and Assistant Secretary for Communications and Information at the U.S. Department of Commerce Lawrence Strickling. Who will help define the Internet’s evolution? What role should government and private industry play? How do we provide greater bandwidth and access? What does online privacy mean in the age of Facebook and Wikileaks? This is a unique opportunity to network with the thought leaders and policy makers who are designing the global networks of tomorrow and help develop the policies that will drive future Internet innovation. Space is limited so it is advisable to register a.s.a.p. The Internet Society (ISOC) is a nonprofit organisation that is built on a network of over 80 local chapters around the world. We are dedicated to ensuring the open development, evolution and use of the Internet for the benefit of people throughout the world. The Internet Society has organized the INET in cooperation with our New York Chapter to provide leadership in Internet related standards, education and policy. 4/19 Rory Cellan-Jones Sir Tim turns the tables (BBC) – video interview about Tim’s recent net neutrality initiative in the UK. INET New York. was held on Tuesday June 14 2011. Speaking in London at an event to mark the 350th anniversary of the founding of the Royal Society, Sir Tim, a long-time and passionate advocate of net neutrality and freedom of speech on the Internet said governments all over the world are intent on imposing controls on the web and censoring its content. Delving back into medieval history Sir Tim added that an Englishman’s right to freedom as enshrined in Magna Carta are as relevant and important today as they were back in 1215 when the barons forced King John to sign the document – or else!